THE CONVERTORUM: Race to the finish!! 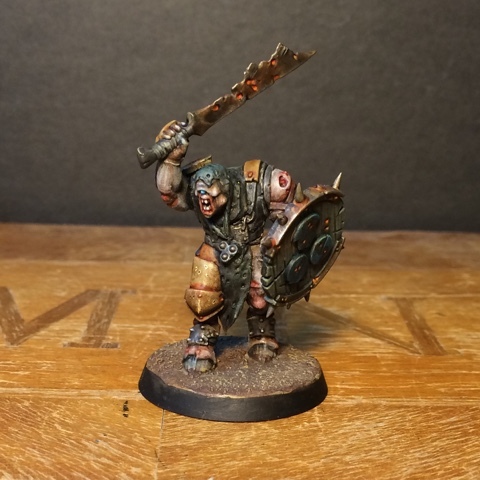 With less than a week before the Path to Glory game I'm struggling to get the warband finished. 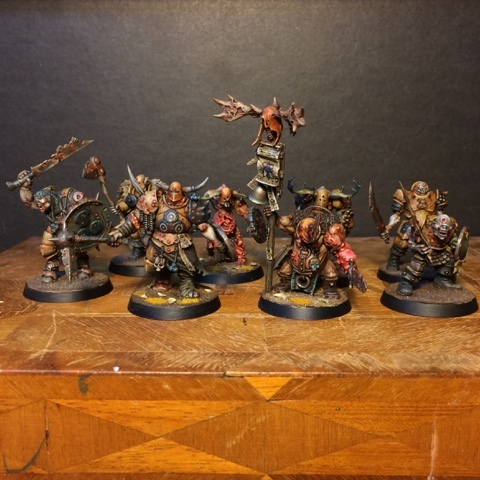 The chaos warriors are all about done. This weeks been spent batchpainting the last five of them. The paintjobs are a bit rougher than the first three but they'll suffice. I'm missing two - it's supposed to be a ten man unit - but to save time I've decided to make up the numbers with two old converted plaguebearers. Obviously the bases aren't quite done yet. Five days to go! The race is on! Wonderful work. That Tick-Troll looks like it'll be a beaut(?) Your warriors are so characterful and I love how seemlessly your old conversions fill the gap of your missing two warriors. Had you not said anything it would have taken me a moment to realise they were older models. My goodness do these new additions look wonderful! I really love the color choices, the ruddy browns and bluish blacks fit together really well. 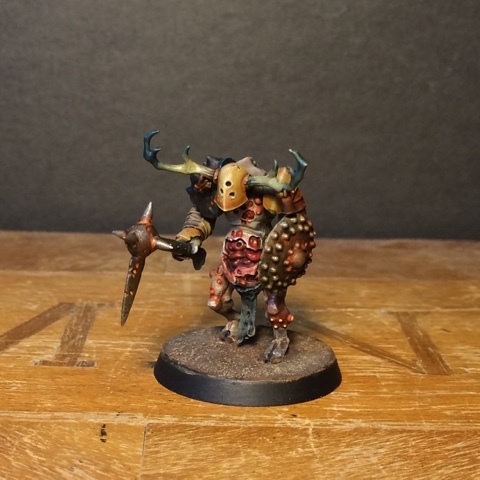 Your first plaguedrone chaos troll is really neat too! He has a really interesting looking silhouette and his large stature compliments the rest of the warband well. Very very nice! I look forward to saturday! Brilliant work! The new warriors look fantastic. The new sword on the second warrior works a lot better than the Plaguebearer one. The troll also looks promising. The human hands at the end of the long insectile limbs, makes the model look extremely creepy! Yeah - thanks for pointing that out! I stole the idea with the human handed insect limbs from one of Bruticus dark mechanicus conversions. If that's a rough paintjob, then mine's damned primitive...which it is. Those spawn-trolls are amazing - best idea I've seen in ages. There's almost no highlights on these guys - it's all done with drybrushing and washes. 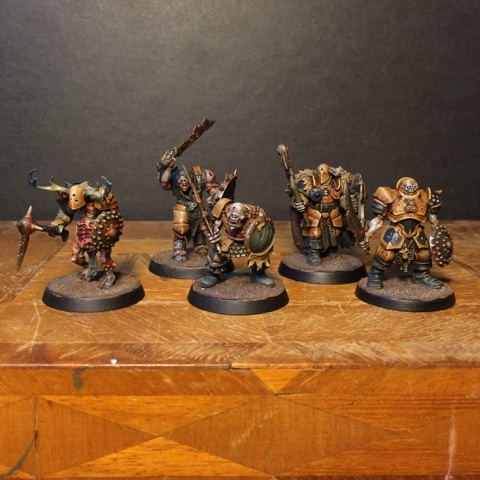 It works quite well but next to the blightkings they do look somewhat sketchy. They all come tighter nicely. I love the colors and the Tick-Trolls look amazing. Will you guys be writing up some reports? We`ll certainly try to make some sort of documentation of the proceedings! Perhaps not a full battle report but att least some sort of coverage. Fantastic work! Hope to see more of these soon! 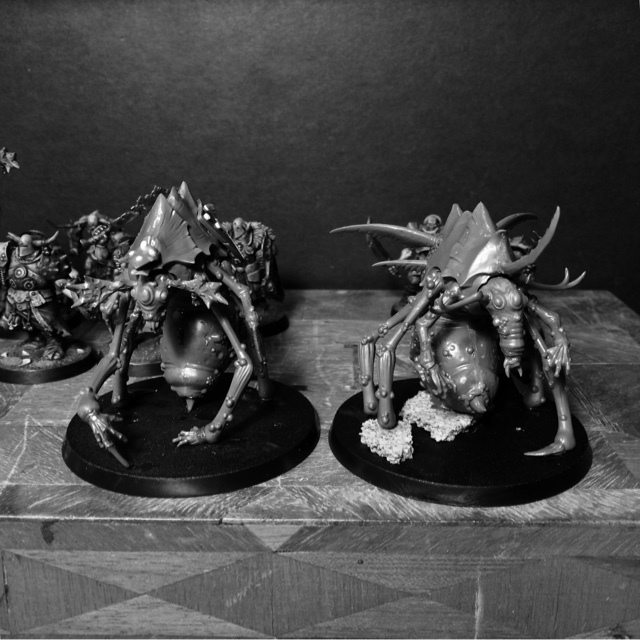 The slightly stooped fellow with the plague bearers head is my favourite (1st & 2nd photographs). Where are his legs from? His legs and torso are from the old plastic chaos warriors. 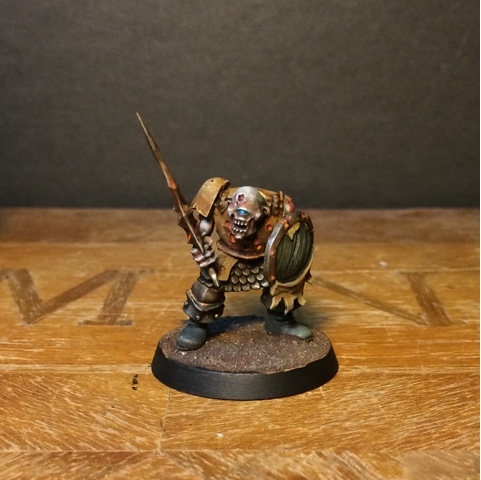 This warband is bound to become a masterpiece! I know you probably feel tired of them by now, that you want to move on to other projects but hold on my friend! This project is so inspiring, and once you will see them battling on the table board against your worthy opponents you will feel like it was all well worthy in the end! Haha! Thank you for those encouraging words! Simply stunning! A real credit to you and hard work. Tick Trolls? Solid idea! Ticks are a bugger to kill, so perfect concept for a troll-type. New warriors still look fantastic, even if you consider them inferior to ones you've painted already. "Rougher" doesn't necessarily equate to inferior - just rougher. Wow, those tick-trolls are seriously good. I also really like the tall chaos warrior with the borad shoulders. 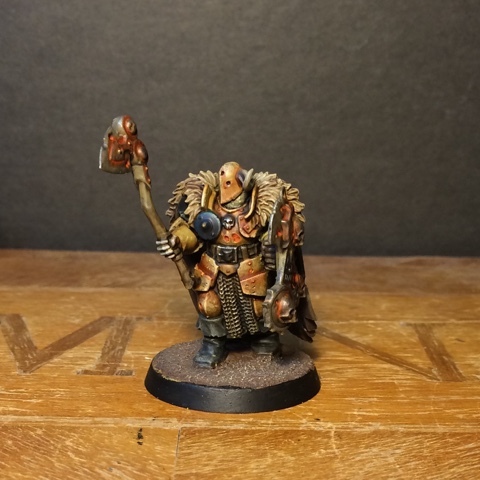 Great looking conversion, and excellent paint job. If you're referring to the second guy - yeah. He's my favourite as well. Ha. I guess it was a misspelling of "broad"... Borad seems to be a Doctor Who villain though but there's nothing particular about his shoulders. 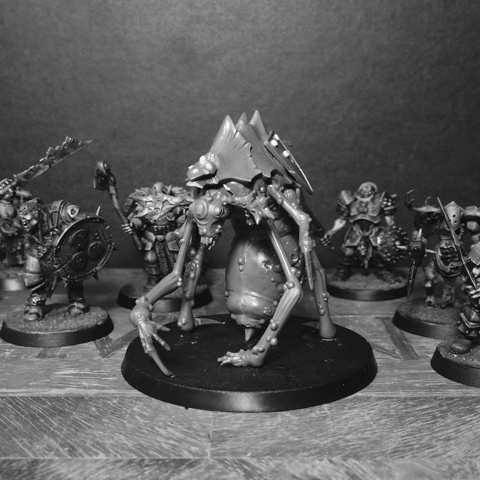 Some of these guys are so well together that they look "bought", that is to say that miniatures designed that way, rather than "mere" kitbashes. Your work is inspiring as always! Every time I look inside this blog new ideas come in my mind. Thank you! But, may I ask you something? 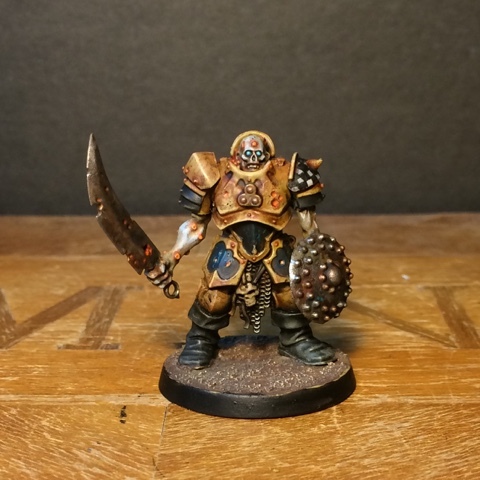 The pauldrons on the second chaos warrior, where did you found them? From wich kit?